For the Old World black vulture, see Cinereous vulture. For the Indian black vulture, see Red-headed vulture. The black vulture (Coragyps atratus), also known as the American black vulture, is a bird in the New World vulture family whose range extends from the southeastern United States to Central Chile and Uruguay in South America. Although a common and widespread species, it has a somewhat more restricted distribution than its compatriot, the turkey vulture, which breeds well into Canada and south to Tierra del Fuego. It is the only extant member of the genus Coragyps, which is in the family Cathartidae. Despite the similar name and appearance, this species is unrelated to the Eurasian black vulture, an Old World vulture in the family Accipitridae (which includes eagles, hawks, kites, and harriers). It inhabits relatively open areas which provide scattered forests or shrublands. With a wingspan of 1.5 m (4.9 ft), the black vulture is a large bird though relatively small for a vulture. It has black plumage, a featherless, grayish-black head and neck, and a short, hooked beak. The black vulture is a scavenger and feeds on carrion, but will also eat eggs or kill newborn animals. In areas populated by humans, it also feeds at garbage dumps. It finds its meals either by using its keen eyesight or by following other (New World) vultures, which possess a keen sense of smell. Lacking a syrinx—the vocal organ of birds—its only vocalizations are grunts or low hisses. It lays its eggs in caves or hollow trees or on the bare ground, and generally raises two chicks each year, which it feeds by regurgitation. In the United States, the vulture receives legal protection under the Migratory Bird Treaty Act of 1918. This vulture also appeared in Mayan codices. Black vulture pair feeding on a mule deer. Plate 106 from The Birds of America by John James Audubon. 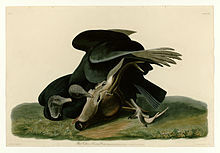 American naturalist William Bartram wrote of the black vulture in his 1792 book Bartram's Travels, calling it Vultur atratus "black vulture" or "carrion crow". German ornithologist Johann Matthäus Bechstein formally described it using this name in 1793. The common name "vulture" is derived from the Latin word vulturus, which means "tearer" and is a reference to its feeding habits. The species name, ātrātus, means "clothed in black," from the Latin āter 'dull black'. Veillot defined the genus Catharista in 1816, listing as its type C. urubu. French naturalist Emmanuel Le Maout placed in its current genus Coragyps (as C. urubu) in 1853. Isidore Geoffroy Saint-Hilaire has been listed as the author in the past, but he did not publish any official description. The genus name means "raven-vulture", from a contraction of the Greek corax/κόραξ and gyps/γὺψ for the respective birds. The American Ornithologists' Union used the name Catharista atrata initially, before adopting Veillot's name (Catharista urubu) in their third edition. By their fourth edition, they had adopted the current name. The black vulture is basal (the earliest offshoot) to a lineage that gave rise to the turkey and greater and lesser yellow-headed vultures, diverging around 12 million years ago. Martin Lichtenstein described C. a. foetens, the Andean black vulture, in 1817, and Charles Lucien Bonaparte described C. a. brasiliensis, from Central and South America, in 1850 on the basis of smaller size and minor plumage differences. However it has been established that the change between the three subspecies is clinal (that is, there is no division between the subspecies), and hence they are no longer recognised. "Black vulture" has been designated the official name by the International Ornithologists' Union (IOC). 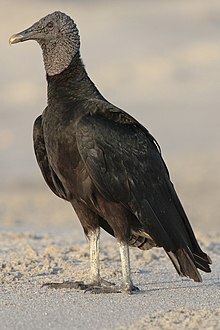 "American black vulture" is also commonly used, and in 2007 the South American Classification Committee (SACC) of the American Ornithological Society unsuccessfully proposed it be the official name of the species. From the Early to the Late Pleistocene, a prehistoric species of black vulture, Coragyps occidentalis, known as the Pleistocene black vulture or—somewhat in error—the "western black vulture", occurred across the present species' range. This bird did not differ much from the black vulture of today except in size; it was some 10–15% larger, and had a relatively flatter and wider bill. It filled the same ecological niche as the living form, and indeed seems to have evolved into it by decreasing in size during the last ice age. Well documented from fossil bones, the genus Coragyps gives a rare glimpse in the evolutionary dynamics of two chronospecies. The final stages of this evolutionary transformation must have been witnessed by humans: a subfossil bone of the extinct species was found in a Paleo Indian to Early Archaic (9000–8000 years BCE) midden at Five Mile Rapids near The Dalles, Oregon. Fossil (or subfossil) black vultures cannot necessarily be attributed to the Pleistocene or the recent species without further information: the same size variation found in the living bird was also present in its larger prehistoric relative. 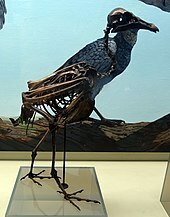 Thus, in 1968, Hildegarde Howard separated the Mexican birds as Coragyps occidentalis mexicanus as opposed to the birds from locations farther north (such as Rancho La Brea) which constituted the nominate subspecies C. o. occidentalis. The southern birds were of the same size as present-day northern black vultures and can only be distinguished by their somewhat stouter tarsometatarsus and the flatter and wider bills, and even then only with any certainty if the location where the fossils were found is known. 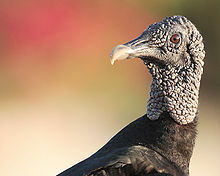 As the Pleistocene and current black vultures form an evolutionary continuum rather than splitting into two or more lineages, some include the Pleistocene taxa in C. atratus. The black vulture is a fairly large bird of prey, measuring 56–74 cm (22–29 in) in length, with a 1.33–1.67 m (52–66 in) wingspan. Weight for black vultures from North America and the Andes ranges from 1.6 to 3 kg (3.5 to 6.6 lb) but in the smaller vultures of the tropical lowlands it is 1.18–1.94 kg (2.6–4.3 lb). 50 vultures in Texas were found to average 2.15 kg (4.7 lb) while 119 birds in Venezuela were found to average 1.64 kg (3.6 lb). The extended wing bone measures 38.6–45 cm (15.2–17.7 in), the shortish tail measures 16–21 cm (6.3–8.3 in) and the relatively long tarsus measures 7–8.5 cm (2.8–3.3 in). Its plumage is mainly glossy black. The head and neck are featherless and the skin is dark gray and wrinkled. The iris of the eye is brown and has a single incomplete row of eyelashes on the upper lid and two rows on the lower lid. The legs are grayish white, while the two front toes of the foot are long and have small webs at their bases. The feet are flat, relatively weak, and are poorly adapted to grasping; the talons are also not designed for grasping, as they are relatively blunt. The nostrils are not divided by a septum, but rather are perforate; from the side one can see through the beak. The wings are broad but relatively short. The bases of the primary feathers are white, producing a white patch on the underside of the wing's edge, which is visible in flight. The tail is short and square, barely reaching past the edge of the folded wings. The subspecies differ in size according to Bergmann's rule, and the amount of white underwing coloration also varies. A leucistic Coragyps atratus brasiliensis was observed in Piñas, Ecuador in 2005. It had white plumage overall, with only the tarsus and tail as well as some undertail feathers being black. It was not an albino as its skin seemed to have had the normal, dark color and it was part of a flock of some twenty normally plumaged individuals. 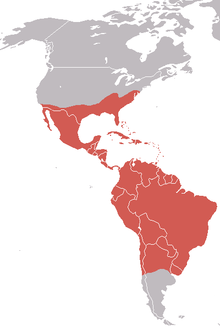 The black vulture has a Nearctic and Neotropic distribution. Its range includes the mid-Atlantic States, the southernmost regions of the Midwestern United States, the southern United States, Mexico, Central America and most of South America. It is usually a permanent resident throughout its range, although birds at the extreme north of its range may migrate short distances, and others across their range may undergo local movements in unfavourable conditions. In South America, its range stretches to central Chile and Uruguay. It also is found as a vagrant on the islands of the Caribbean. It prefers open land interspersed with areas of woods or brush. It is also found in moist lowland forests, shrublands and grasslands, wetlands and swamps, pastures, and heavily degraded former forests. Preferring lowlands, it is rarely seen in mountainous areas. It is usually seen soaring or perched on fence posts or dead trees. The black vulture soars high while searching for food, holding its wings horizontally when gliding. It flaps in short bursts which are followed by short periods of gliding. Its flight is less efficient than that of other vultures, as the wings are not as long, forming a smaller wing area. In comparison with the turkey vulture, the black vulture flaps its wings more frequently during flight. It is known to regurgitate when approached or disturbed, which assists in predator deterrence and taking flight by decreasing its takeoff weight. Like all New World vultures, the black vulture often defecates on its own legs, using the evaporation of the water in the feces and/or urine to cool itself, a process known as urohidrosis. It cools the blood vessels in the unfeathered tarsi and feet, and causes white uric acid to streak the legs. Because it lacks a syrinx, the black vulture, like other New World vultures, has very few vocalization capabilities. It is generally silent, but can make hisses and grunts when agitated or while feeding. The black vulture is gregarious, and roosts in large groups. In areas where their ranges overlap, the black vulture will roost on the bare branches of dead trees alongside groups of turkey vultures. The black vulture generally forages in groups; a flock of black vultures can easily drive a rival turkey vulture, which is generally solitary while foraging, from a carcass. The timing of black vultures' breeding season varies with the latitude at which they live. In the United States, birds in Florida begin breeding as early as January, for example, while those in Ohio generally do not start before March. In South America, Argentinian and Chilean birds begin egg-laying as early as September, while those further north on the continent typically wait until October. Some in South America breed even later than that—black vultures in Trinidad typically do not start until November, for example, and those in Ecuador may wait until February. Pairs are formed following a courtship ritual which is performed on the ground: several males circle a female with their wings partially open as they strut and bob their heads. They sometimes perform courtship flights, diving or chasing each other over their chosen nest site. The black vulture lays its eggs on the ground in a wooded area, a hollow log, or some other cavity, seldom more than 3 m (10 ft) above the ground. While it generally does not use any nesting materials, it may decorate the area around the nest with bits of brightly colored plastic, shards of glass, or metal items such as bottle caps. Clutch size is generally two eggs, though this can vary from one to three. The egg is oval and on average measures 7.56 cm × 5.09 cm (2.98 in × 2.00 in). The smooth, gray-green, bluish, or white shell is variably blotched or spotted with lavender or pale brown around the larger end. Both parents incubate the eggs, which hatch after 28 to 41 days. Upon hatching, the young are covered with white down. Both parents feed the nestlings, regurgitating food at the nest site. The young remain in the nest for two months, and after 75 to 80 days they are able to fly skillfully. 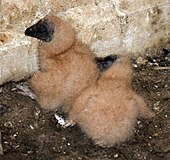 Predation of black vultures is relatively unlikely, though eggs and nestlings are readily eaten if found by mammalian predators such as raccoons, coatis and foxes. Due to its aggressiveness and size, few predators can threaten the fully-grown vulture. However, various eagles may kill vultures in conflicts and even the ornate hawk-eagle, a slightly smaller bird than the vulture, have preyed on adult black vultures. In natural settings, the black vulture eats mainly carrion. In areas populated by humans, it may scavenge at garbage dumps, but also takes eggs and decomposing plant material and can kill or injure newborn or incapacitated mammals. Like other vultures, it plays an important role in the ecosystem by disposing of carrion which would otherwise be a breeding ground for disease. The black vulture locates food either by sight or by following New World vultures of the genus Cathartes to carcasses. These vultures—the turkey vulture, the lesser yellow-headed vulture, and the greater yellow-headed vulture—forage by detecting the scent of ethyl mercaptan, a gas produced by the beginnings of decay in dead animals. Their heightened ability to detect odors allows them to search for carrion below the forest canopy. The black vulture is aggressive when feeding, and may chase the slightly larger turkey vulture from carcasses. The black vulture also occasionally feeds on livestock or deer. It is the only species of New World vulture which preys on cattle. It occasionally harasses cows which are giving birth, but primarily preys on newborn calves. In its first few weeks, a calf will allow vultures to approach it. The vultures swarm the calf in a group, then peck at the calf's eyes, or at the nose or the tongue. The calf then goes into shock and is killed by the vultures. Black vultures have sometimes been seen to pick ticks off resting capybaras. Like other birds with scavenging habits, the black vulture presents resistance to pathogenic microorganisms and their toxins. Many mechanisms may explain this resistance. Anti-microbial agents may be secreted by the liver or gastric epithelium, or produced by microorganisms of the normal microbiota of the species. The black vulture is considered a threat by cattle ranchers due to its predation on newborn cattle. The droppings produced by black vultures and other vultures can harm or kill trees and other vegetation. The bird is also considered a threat to the safety of aerial traffic, especially when it congregates in large numbers in the vicinity of garbage dumps—as is the case in the Rio de Janeiro Tom Jobim International Airport. The black vulture appears in a variety of Maya hieroglyphics in Mayan codices. It is normally connected with either death or as a bird of prey. The vulture's glyph is often shown attacking humans. This species lacks the religious connections that the king vulture has. While some of the glyphs clearly show the black vulture's open nostril and hooked beak, some are assumed to be this species because they are vulture-like but lack the king vulture's knob and are painted black. This vulture has appeared on two stamps: those of Guyana in 1990 and Nicaragua in 1994. ^ a b c BirdLife International (2016). "Coragyps atratus". IUCN Red List of Threatened Species. IUCN. 2016: e.T22697624A93624950. doi:10.2305/IUCN.UK.2016-3.RLTS.T22697624A93624950.en. Retrieved November 6, 2017. ^ Bartram, William. Travels through North and South Carolina, Georgia, East and West Florida, the Cherokee country, the extensive territories of the Muscogulges or Creek confederacy, and the country of the Chactaws. Containing an account of the soil and natural productions of those regions; together with observations on the manners of the Indians. Embellished with copper-plates. p. 285. ^ Simpson, D.P. (1979). Cassell's Latin Dictionary (5th ed.). London: Cassell Ltd. pp. 63–64. ISBN 0-304-52257-0. ^ Veillot, Louis-Pierre (1816). Analyse d'une nouvelle ornithologie élémentaire (in French). Deterville. pp. 21–22. ^ Gregory, Steven M. S. (1998). "The correct citation of Coragyps (Cathartinae) and Ardeotis (Otididae)". Bulletin of the British Ornithologists' Club. 118: 126–27. ^ Ietaka, Taro. "Moving Beyond Common Names" (PDF). Archived from the original (PDF) on May 4, 2005. Retrieved November 5, 2007. ^ Liddell, Henry George; Scott, Robert (1980). Greek-English Lexicon, Abridged Edition. Oxford University Press. pp. 147, 387. ISBN 0-19-910207-4. ^ American Ornithologists' Union (1910). Check-list of North American birds (3rd ed.). American Ornithologists' Union. p. 152. ^ American Ornithologists' Union (1931). Check-list of North American birds (4th ed.). American Ornithologists' Union. p. 61. ^ Johnson, Jeff A.; Brown, Joseph W.; Fuchs, Jerome; Mindell, David P. (2016). "Multi-locus phylogenetic inference among New World Vultures (Aves: Cathartidae)" (PDF). Molecular Phylogenetics and Evolution. 105: 193–199. doi:10.1016/j.ympev.2016.08.025. PMID 27601346. ^ Blake, Emmet Reid (1953). Birds of Mexico: A Guide for Field Identification. University of Chicago Press. p. 267. ISBN 0-226-05641-4. ^ a b Houston, D., Kirwan, G.M. & Boesman, P. (2017). American Black Vulture (Coragyps atratus). In: del Hoyo, J., Elliott, A., Sargatal, J., Christie, D.A. & de Juana, E. (eds.). Handbook of the Birds of the World Alive. Lynx Edicions, Barcelona. (retrieved from http://www.hbw.com/node/52943 on 21 October 2017). ^ a b Gill, Frank; Donsker, David, eds. (2017). "New World vultures, Secretarybird, kites, hawks & eagles". World Bird List Version 7.1. International Ornithologists' Union. Retrieved October 22, 2017. ^ South American Classification Committee (2007). "Proposal (259) to South American Classification Committee: Change English name of Coragyps atratus to "American Black Vulture"". American Ornithological Society. Retrieved October 22, 2017. ^ Fisher, Harvey L (1944). "The skulls of the Cathartid vultures" (PDF). Condor. 46 (6): 272–296. doi:10.2307/1364013. JSTOR 1364013. Retrieved November 3, 2007. ^ Hertel, Fritz (1995). "Ecomorphological indicators of feeding behavior in Recent and fossil raptors" (PDF). Auk. 12 (4): 890–903. doi:10.2307/4089021. JSTOR 4089021. Retrieved November 3, 2007. ^ Howard, Hildegarde (1962). "Bird Remains from a Prehistoric Cave Deposit in Grant County, New Mexico" (PDF). Condor. 64 (3): 241–242. doi:10.2307/1365205. JSTOR 1365205. Retrieved November 3, 2007. ^ a b Steadman, David W; Arroyo-Cabrales, Joaquin; Johnson, Eileen; Guzman, A. Fabiola (1994). "New Information on the Late Pleistocene Birds from San Josecito Cave, Nuevo Leon, Mexico" (PDF). Condor. 96 (3): 577–589. doi:10.2307/1369460. Retrieved November 3, 2007. ^ Miller, Loye (1957). "Bird Remains from a Prehistoric Cave Deposit in Grant County, New Mexico" (PDF). Condor. 59 (1): 59–63. doi:10.2307/1364617. JSTOR 1364617. Retrieved November 3, 2007. ^ Howard, Hildegarde (1968). "Limb measurements of the extinct vulture, Coragyps occidentalis". Papers of the Archaeological Society of New Mexico. 1: 115–127. ^ Arroyo-Cabrales, Joaquin; Johnson, Eileen (2003). "Catálogo de los ejemplares tipo procedentes de la Cueva de San Josecito, Nuevo León, México ("Catalogue of the type specimens from San Josecito Cave, Nuevo León, Mexico")" (PDF). Revista Mexicana de Ciencias Geológicas. 20 (1): 79–93. Retrieved November 3, 2007. ^ "Nature Guides". Enature.com. Archived from the original on March 4, 2016. Retrieved June 2, 2014. ^ Ferguson-Lees, James & Christie, David A. (2001). Raptors of the World. Houghton Mifflin Harcourt. p. 309. ISBN 978-0-618-12762-7. ^ Fisher, Harvey L. (February 1942). "The Pterylosis of the Andean Condor". Condor. 44 (1): 30–32. doi:10.2307/1364195. JSTOR 1364195. ^ a b Peterson, Roger Tory (2001). A Field Guide to Western Birds. Houghton Mifflin Field Guides. p. 182. ISBN 0-618-13218-X. ^ a b c Feduccia, J. Alan (1999). The Origin and Evolution of Birds. Yale University Press. p. 116. ISBN 0-226-05641-4. ^ Hosner, Peter A; Lebbin, Daniel J (2006). "Observations of plumage pigment aberrations of birds in Ecuador, including Ramphastidae" (PDF). Boletín de la Sociedad Antioqueña de Ornitología. 16 (1): 30–42. Retrieved November 3, 2007. ^ Bull, John L; Levine, Emanuel (1998). Bull's Birds of New York State. Cornell University Press. p. 138. ISBN 0-8014-3404-1. ^ Garcia, Lisa. "Black Vulture". The Natural History of the Chihuahuan Desert. University of Texas at El Paso. Retrieved September 13, 2016. ^ Buckley, N. J. (1999). Black Vulture (Coragyps atratus). In The Birds of North America, No. 411 (A. Poole and F. Gill, eds.). The Birds of North America, Inc., Philadelphia, PA.
^ Hilty, Stephen L. (1977). A Guide to the Birds of Colombia. Princeton University Press. p. 88. ISBN 0-691-08372-X. ^ a b c d Harrison, Hal H. (1979). A Field Guide to Western Birds' Nests. Houghton Mifflin Field. p. 33. ISBN 0-618-16437-5. ^ Robbins, C. S.; Bruun, B; Zim, H S (2001). Birds of North America: A Guide to Field Identification. St. Martin's Press. p. 66. ISBN 1-58238-090-2. ^ a b c Fergus, Charles (2003). Wildlife of Virginia and Maryland Washington D.C. Stackpole Books. p. 172. ISBN 0-8117-2821-8. ^ a b "All About Birds: Black Vulture". Cornell Lab of Ornithology. 2003. Retrieved November 4, 2007. ^ a b Snyder, Noel F. R. & Helen Snyder (2006). Raptors of North America: Natural History and Conservation. Voyageur Press. p. 45. ISBN 0-7603-2582-0. ^ a b c Ferguson-Lees, James; David A. Christie (2001). Raptors of the World. London: Christopher Helm. p. 306. ISBN 0-7136-8026-1. ^ a b c Reader's Digest, ed. (2005). Book Of North American Birds. Reader's Digest. p. 11. ISBN 0-89577-351-1. ^ a b Gomez, Luis G.; Houston, David C.; Cotton, Peter; Tye, Alan (1994). "The role of greater yellow-headed vultures Cathartes melambrotus as scavengers in neotropical forest". Ibis. 136 (2): 193–196. doi:10.1111/j.1474-919X.1994.tb01084.x. ^ Paulik, Laurie (August 6, 2007). "Vultures and Livestock". AgNIC Wildlife Damage Management Web. Archived from the original on August 8, 2007. Retrieved October 15, 2007. ^ Sazima, Ivan (2007). "Unexpected cleaners: black vultures (Coragyps atratus) remove debris, ticks, and peck at sores of capybaras (Hydrochoerus hydrochaeris), with an overview of tick-removing birds in Brazil" (PDF). Rev. Bras. Ornitol. 15 (1): 417–426. Archived from the original (PDF) on November 14, 2010. ^ Carvalho, L. R.; et al. (2003). "Dominant culturable bacterial microbiota in the digestive tract of the American black vulture (Coragyps atratus Bechstein 1793) and search for antagonistic substances". Braz. J. Microbiol. 34 (3): 218–224. ^ Milleson, Michael P.; Stephanie P. Shwiff; Michael L. Avery (2006). "Vulture-Cattle Interactions – A Survey of Florida Ranchers" (PDF). Proceedings, 22nd Vertebrate Pest Conference. University of California, Davis. Archived from the original (PDF) on December 10, 2015. Retrieved December 9, 2007. ^ Paulik, Laurie (August 6, 2007). "Vultures". AgNIC Wildlife Damage Management Web. Archived from the original on August 10, 2007. Retrieved October 15, 2007. ^ a b "Migratory Bird Treaty Act". US Code Collection. Cornell Law School. Retrieved October 14, 2007. ^ "Birds Protected by the Migratory Bird Treaty Act". US Fish & Wildlife Service. Archived from the original on October 10, 2007. Retrieved October 14, 2007. ^ a b "Game and Wild Birds: Preservation". US Code Collection. Cornell Law School. Retrieved October 29, 2007. ^ Tozzer, Alfred Marston; Glover Morrill Allen (1910). Animal Figures in the Maya Codices. Harvard University. ^ "Black Vulture". Bird Stamps. Retrieved January 11, 2012. Wikimedia Commons has media related to Black vulture. "American black vulture media". Internet Bird Collection.